SCMP: “Chinese military officials will have to undergo an audit before they can retire or be promoted, state media reported on Tuesday, in the latest measure in the leadership’s campaign against corruption. The audit will encompass officials’ “real estate property, their use of power, official cars and service personnel”, the Xinhua news agency reported, citing a guideline issued by the Central Military Commission. The guideline aims to improve the “work style” of military officials and fight against graft, the report said. President Xi Jinping has called corruption a threat to the Communist Party’s very survival, and vowed to go after powerful “tigers” as well as lowly “flies”. 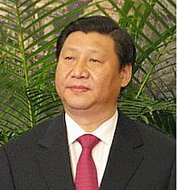 Xi is also chairman of the Central Military Commission and the country’s top military official. Military officers who stand to be promoted to regimental commander-level posts and above, as well as those who plan to take up civilian posts or retire, will have to submit to an audit, the report said. The military began replacing licence plates on its cars and trucks in April in a move to crack down on fleets of luxury vehicles that routinely run red lights, drive aggressively and fill up on free fuel. Military plates enable drivers to avoid road tolls and parking fees and are often handed out to associates as perks or favours. via China to audit military officials in move to fight graft | South China Morning Post.